I am truly amazed at how much media production we can accomplish on a computer now. I remember when QuickTime was introduced back around 1990, and thinking, "Well, that's cool, but it's not going to replace tape to tape editing any time soon." Turns out "any time soon" was about 5 years, as that's when I bought my first full-frame QuickTime based editing system. Back then, there were precious few tools to help us manage the coming onslaught of digital data. In fact, the early systems were not much more than digital A/B roll editors. But they were the future. Today, it is possible to create video productions using just a laptop that would have required 2 rooms full of hardware a decade (well, maybe a decade and a half) ago. With the rapid proliferation of digital formats, files and media we have to deal with we have to find ways to make it all work together. While everyone knows about FinalCut Pro, Premier, After Effects and the other big players, today I'm going to highlight some of the unsung players in our industry. The little tools and widgets that make life easier in the digital media age. These are a few of my favorite little tools. It happens all the time. You need a music bed for your project, so you surf over to FreePlay Music or another online site and find the perfect track. Once downloaded you find that it doesn't play right away on your timeline because it's compressed (either MP3 or AAC, or something else altogether). Sure, you could open your audio editor, or have FCP render it out. Or, you could drag it onto the Switch icon. In under 20 seconds, you have a easy to work with AIFF or WAV file. No fuss, no muss. You can batch convert, and pick your file format settings. It does one thing—convert nearly any audio file to anything else—and it does it really well. And it's free! Sort of like Switch for video, VisualHub is a great tool for converting any video format to any other format. And it's fast. You don't have a lot of control over the video settings, but it makes quick work of tearing through the conversion process. It will also work in batches and I've not found a format it won't handle (though I'm sure there are some). It's not free, but it is cheap. At under $25, it pays for itself in one session. I find myself using it a lot when we get user provided content; everything from MP4 camcorder video to Flash file. Kuler is one of the coolest things to come out of Adobe Labs. It's a Dashboard widget, an Air Application and a web-based service. 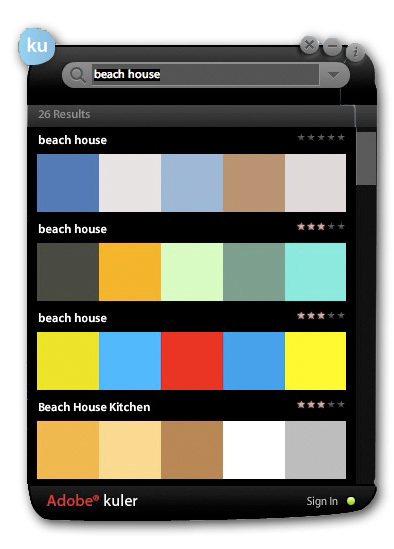 Kuler helps you figure out what colors go with what. I have a great eye for composition, but I'm not so great at picking color themes. Kuler makes it easy. You can pick a base color, and it will let you create a nearly endless variety of complementary colors in a 5 color set. New to the web service is a feature to load in a photo, sample a color and it will generate five complementary colors from that sample. Very cool. There are thousands of themes to choose from, so if you're trying to come up with some graphics and you have a desire to use colors from a 70's kitchen or a beach house or a desert, search those phrases and see what someone else has already come up with. You can even save the color set, import directly into Illustrator and by swapping color sets, come up with variations on your design. You have to go get Kuler. Now. 99% of the time Stuffit will unzip your files perfectly. But what about the 1% of the time it doesn't. It's happened to me and it's not fun. The answer is The Unarchiver. Another in the line of "do one thing and do it well" products, The Unarchiver unzips files. That's it. It does it fast, and it does it right. It's also free. I'm not sure who comes up with these app names, but they're clever (if not obscure). Cocktail is my favorite Mac OS maintenance tool. Computers are like cars in that they've gotten a lot more reliable over the years. To extend the analogy, Macs are like Hondas. Change the oil, rotate the tires once in a while and you're good to go for a long time. They do need occasionally maintenance, however. Apple thoughtfully built maintenance scripts into the OS, but they only run at 2 AM. If you're a cheapskate like me and don't leave your computer on 24/7, they don't run. Enter Cocktail. You can set it up to run basic maintenance tasks when you know the computer is on, or fire the scripts manually. It's the equivalent of a regular tune up. And at $23, it's a lot less than your mechanic will charge you to open the hood. So there you go. A quick collection of tools to make your digital-media life easier. Have a favorite I didn't mention? Dont' keep it to yourself. Share it with the rest of us in a comment. Thanks for reading!